Many cities have iconic landmarks: New York City's Statue of Liberty, Paris's Eiffel Tower, Beijing's Great Wall. 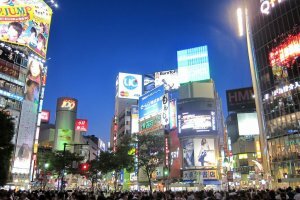 Tokyo has some unique features, of course, such as Tokyo Tower and the SkyTree, but to me the most identifiable landmark to the city will always be Shibuya Crossing. 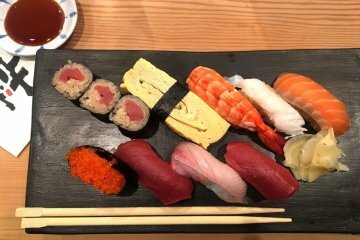 It is an unquestioned must-visit for any trip to Tokyo. The sprawling scramble intersection just outside Shibuya Station is an embodiment of Tokyo itself: action in all directions. 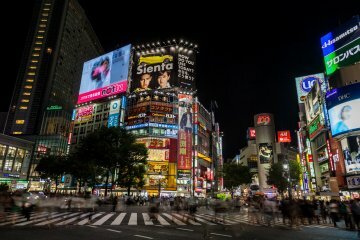 Three huge television screens mounted on the buildings facing the intersection flash all day, while the rest of the area is covered with lights, advertisements, and more lights. And that's just when you're looking up. 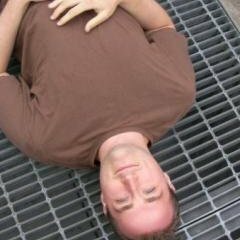 Look down, and you'll see the most remarkable feature of the area: the people. 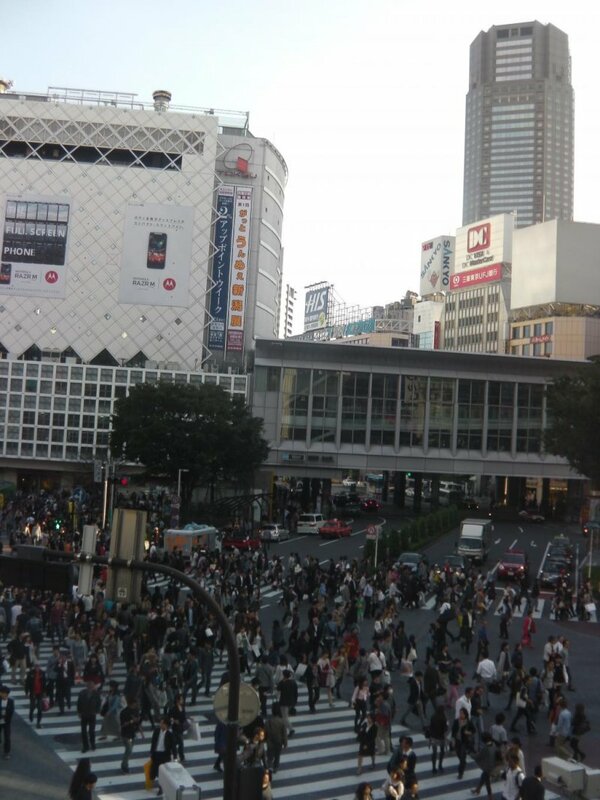 People are constantly pouring across the street from all directions going to even other directions. 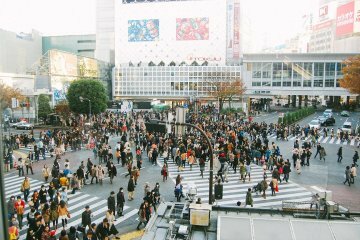 They all meet in the middle in a frantic mess, bumping, side stepping and swerving around each other as they try to cross. Then, for a few minutes, it stops. 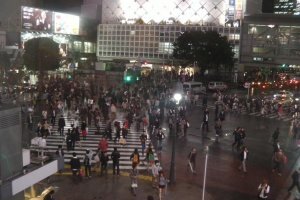 These are some of my favorite times to be an observer at Shibuya Crossing: while the traffic gets its turn, each little corner of the intersection steadily fills up, up, up, and just as the people begin to spill out into the street, the crosswalk lights turn green and the mayhem starts all over again. 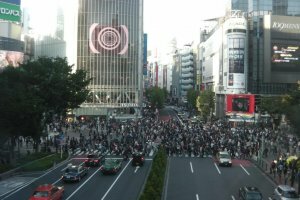 The intersection is a popular location for movies and media taking place in Tokyo. 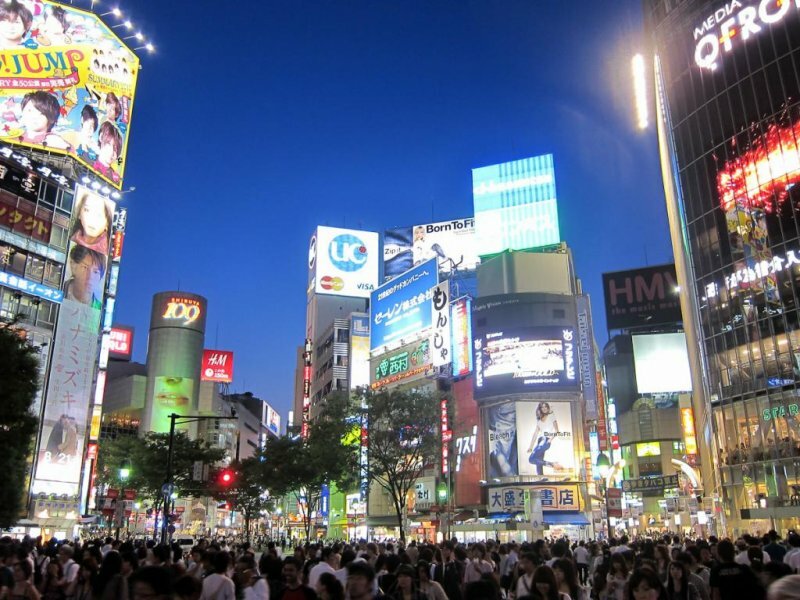 It has appeared in the films "Lost in Translation" and "The Fast and the Furious: Tokyo Drift," while making appearances in numerous music videos, newscasts, and animated programs. 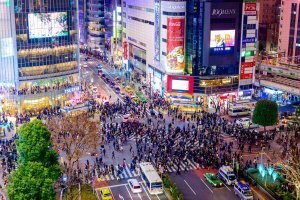 As a famous representation of modern Japan, photographers and videographers are almost constantly circling the intersection, climbing on guard rails and perching on subway entrances in an effort to find the best vantage point. 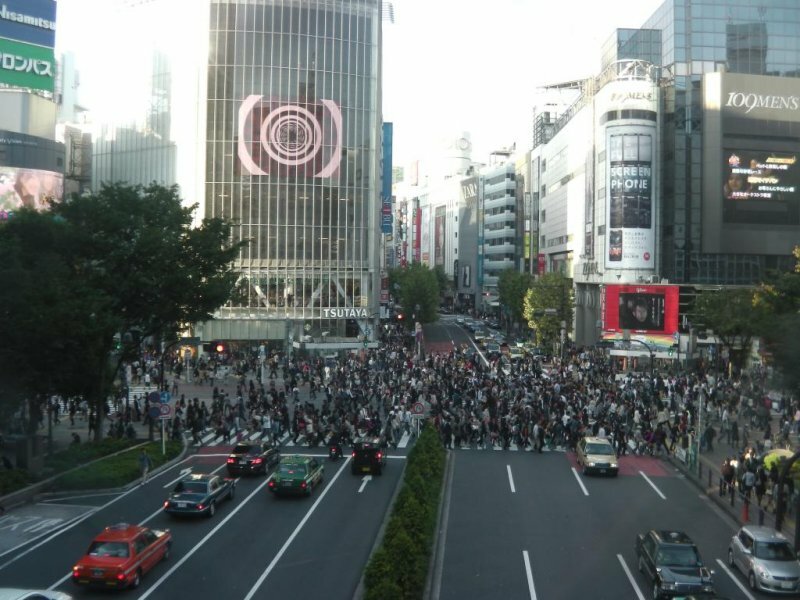 While fighting your way through the havoc in the center of the intersection is something any visitor to Tokyo should experience, Shibuya Crossing is also one of the most soothing and peaceful things to watch from a distance. The businesses facing the intersection all take advantage of their scenic position and have tables and windows facing the crossing. 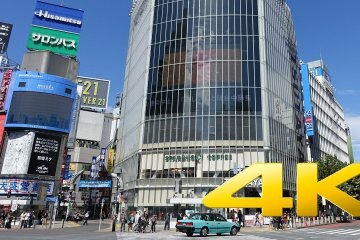 One of the most popular is the giant Starbucks located across from Shibuya Station. In addition to being a constant contender for the busiest branch in the world, its second floor seating area has a counter across its floor-to-ceiling windows, perfect for overlooking the intersection. 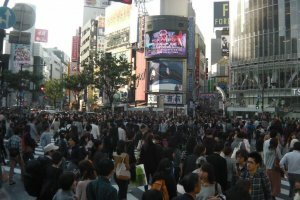 The surrounding area of Shibuya is a lively, popular destination for people of all walks of life. 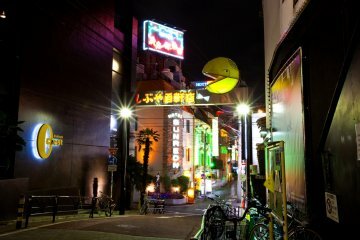 It is a popular nightlife spot filled with bars, clubs and izakaya, and weekend revelry is a common sight. 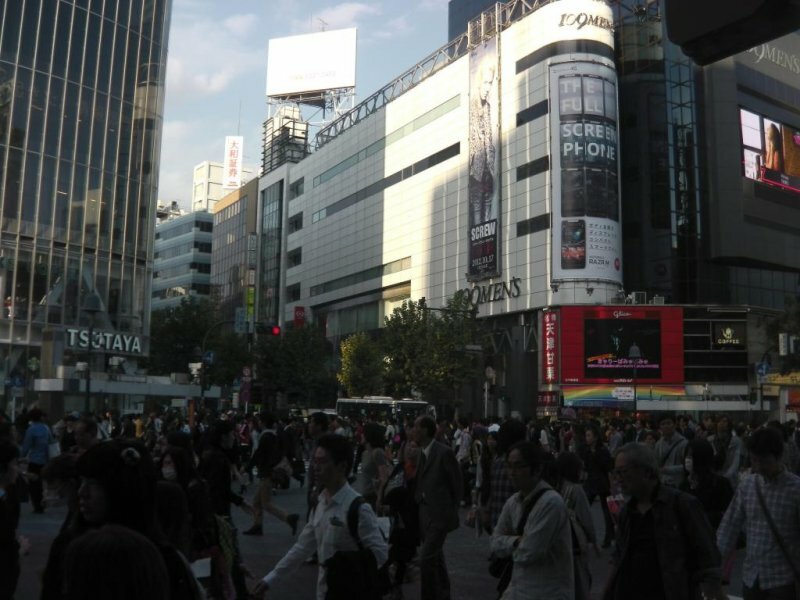 It is also a trendy shopping district. 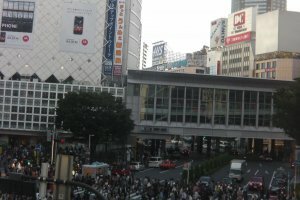 Shibuya Station itself is a large hub of Tokyo trains and subways. 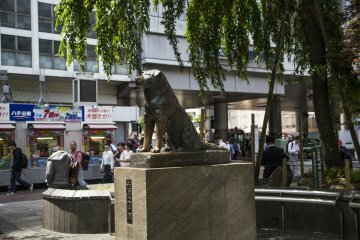 Its Hachiko Exit (Exit #8), which leads to Shibuya Crossing, is enormous and always bustling, and is one of the most popular meeting points in the city. 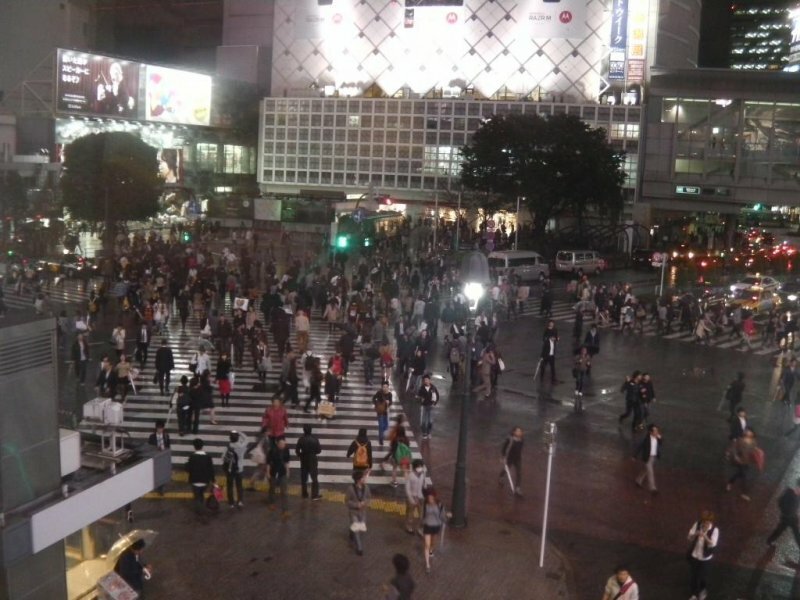 Many other subway exits of the station also surround the intersection. While Shibuya Crossing may never receive the international status of other cities' landmark buildings, towers and bridges, it is an undeniable representation of the City of Tokyo itself: lots of people, lots of action, and lots of fun. 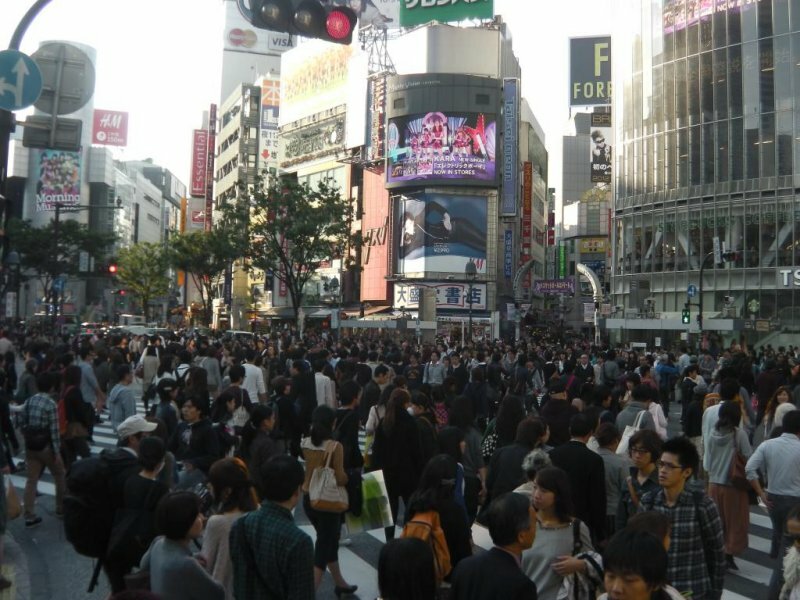 Shibuya Crossing - "The Scramble"
Everyone loves a good Shibuya Crossing. I worked around the corner from the station. On a rainy Friday evening, it’s a canopy of vinyl umbrellas. 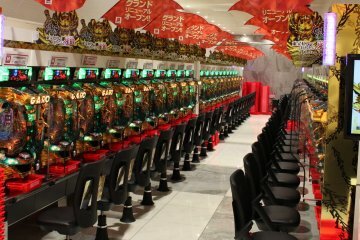 Definitely somewhere I tell visitors to check out - it's sensory overload in every way! Yes, sensory overload is a perfect way of describing it. 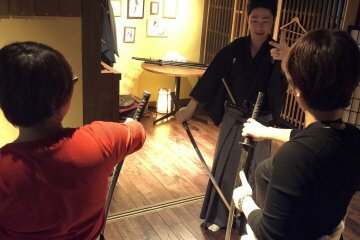 Gotta go here if you go to Tokyo!